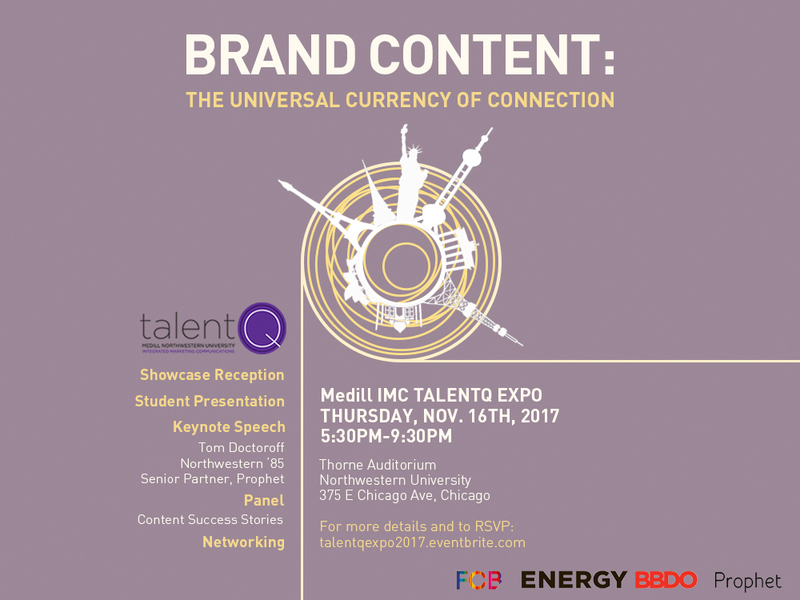 talentQ, a student-led IMC committee that strives to bridge the gap between industry practice and in-class learning, will be hosting its annual exposition event on November 16 in downtown Chicago at Thorne Auditorium. Both the keynote speaker and panel discussion will explore the topic of Brand Content: The Universal Currency of Connection. Globalization has opened up many opportunities for brands to connect with their audiences across the world. Even in a highly fragmented and changing environment, creative content and ideas remain the core to a marketer's success. How have various agencies leveraged their brand ideas and content to flourish internationally? Join the talentQ team for a great night of conversation and hear from leading marketing professionals including Tom Doctoroff, senior partner at Prophet, a global brand and marketing consultancy. Doctoroff, a Northwestern alumnus, will be speaking on how international brands stay relentlessly relevant through meaningful content. He is one of the world’s foremost experts on Chinese consumer behavior and the Asian commercial landscape and is the former CEO of J. Walter Thompson (Asia-Pacific). A panel discussion of marketing professionals will follow, as they showcase how they’ve put these content theories into practice with their own content success stories. In addition, the Medill IMC Spiegel Research Center will share findings on "Data in Content Marketing: Aligning Topic, Audience, and Outcomes." Other IMC student committees will also present their work at booths during the Student Showcase Reception. The entire Medill community is invited to attend this Chicago marketing communications community event.